For all the great things the United States is and offers to those that live here, its culture has lost much of its substance, including many of its traditions of thought and behavior that served the nation well for 200 years before being abandoned starting in the late 1960s. Specifically, we Americans have allowed our embrace of self-reliance and our sense of personal responsibility to fade away. I often defend the laws/rules of Christianity and Judaism for the simple reason that a society that follows these rules will be a healthy and stable society. America is no longer a healthy and stable society, and I maintain that to the degree we have thrown off the Judeo-Christianity morality we have lost that health and stability. Some will disagree. One thing a stable society must have is a set of rules, formal and informal, that guide behavior so that the society as a whole will remain healthy, as ours did up until about 40 years ago when its downfall began. In trying to draw up social standards there are inevitably conflicts between personal freedom and social stability; what is desirable for the individual is often at odds with what is good for all of society. However, when we draw the lines between acceptable and unacceptable behavior, when we identify those acts that we deem beyond debate, but inarguably unacceptable, such as murder, theft, violence against others, and so forth, we then must set forth some punishment for those who commit those prohibited acts. We have a Constitutional prohibition against cruel and unusual punishment, and I maintain that depending upon what someone has done the definition ought to be loose enough to allow the perpetrator of horrible acts to be punished as horribly as the act he or she committed. One may believe that by being less horrible to criminals than they were to their victims we are being "compassionate" or somehow "better" or "more human" than the criminals, but the reality is that by treating the cretins better than they deserve we are showing weakness, not compassion. The punishment for a violent crime ought to be awful enough to make the perpetrator regret his deeds and have remorse for what he did, and it ought to be bad enough to give those who have not yet committed some heinous act a reason to rethink doing so before doing it. Previously I said that I would abandon my preference for the death penalty in favor of life imprisonment at hard labor where the prisoner lived a bare existence with nothing more than the basic necessities of life and a day of physically difficult work. Such an approach might assuage the guilt of those who believe that taking the life of another individual is wrong, no matter how vile, disgusting and intolerable that individual's acts might be. Some of those people won't like this approach, either, however. But we also have to reexamine the crimes that earn imprisonment for the perpetrator. Prison space must be reserved for the worst of our society, the violent criminals. White collar criminals should be made to ply their trade with society as the beneficiary of their work. A doctor who has defrauded the Medicare system shouldn't be in jail, he or she should be providing medical care for those needing medical care. A lawyer who violates his fiduciary duty should provide legal assistance to people who can't afford it and his income should go toward repaying those he defrauded, whether it is the government, or his clients. Put people with useful skills to work for society, not in a jail cell. Jail is always a mis-step away, however, and the more miserable jail time is, the harder people will work to avoid it. 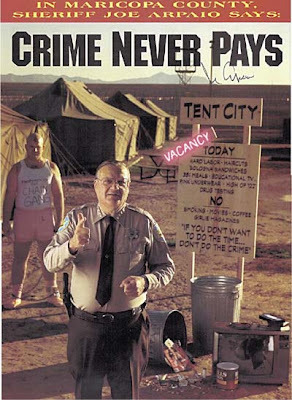 To paraphrase Sheriff Joe Arpaio of Maricopa County, Arizona: This is jail, not a country club; if you don't like the way we do things here, don't come back. Unless we make jail time awful enough that inmates don't want to come back a second time, they will continue doing things that will end them up in jail again and again.